This is a photo of the new custom spinning wheel I have on order. It's a Watson Wheel, hand made by Andrew Watson who lives in Ontario, Canada. These wheels are truly a work of art, high in demand by spinners. It will take nearly 2 years before I get it, he's busy with other orders, plus it takes time to make it! I am so excited, it will be a long wait but worth it. 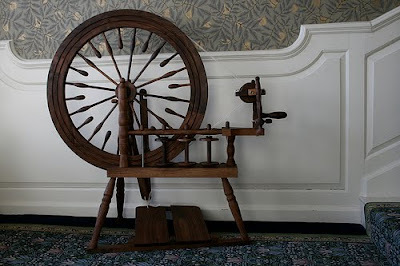 The wood is black walnut, the wheel measures 30 inches. I am getting additional bobbins and a lazy kate to match. I have special ordered the flyer on the right side. I also had a choice in having additional spokes, how the spokes are carved , there are a lot of choices to make regarding wood type, finish style, how ornate you want the carvings. There is a victorian style that is much more intricate than this but I think this one is perfect for me. Isn't she gorgeous!! !